My Joy sentiment is from the Pear & Partridge Complements pack. 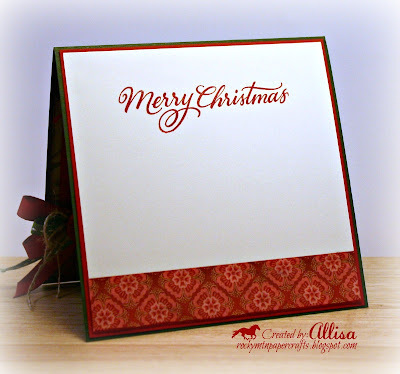 I added the Wishing you sentiment to the top, which is from the December Stamp of the Month. My bow is lots of layers tied together with a button. The best advice I have on designing bows....tie it all together and then work on arranging your loops. Your bow comes together much easier this way. Trust me....ribbon can take a lot of abuse. Twist and pull until you have the design you are seeking. 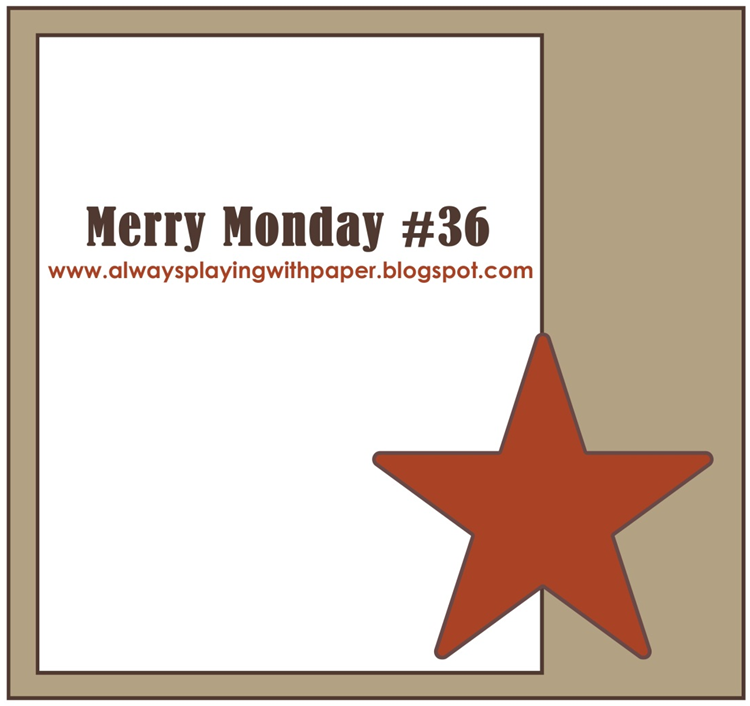 Design Tip-When you add lots of layers or embellishments to the front of your card....add some extra layers to the inside as well. This will help balance your card so that it is not top heavy. I added an additional layer of cardstock to the inside of my card to balance the weight from my embellishments. Thanks so much for stopping by! Hope to see your creation at Merry Monday! I LOVE,LOVE,LOVE ALL of your cards!! !They are so Beautiful!You are Amazing!! Beautiful! I love your fancy bow! Beautiful Allisa! I love the soft muted tones and your lovely layout. Hugs! Allisa, what a beautiful bow and just perfect for this sketch! Congratulations on your win last week and thanks so much for being our Guest Designer this week. Gorgeous card as always Allisa, the warm rich colours are truly wonderful! Happy to have you as a GD with us this week! Fabulous card Allisa, I love the paper you used and your bows are stunning. It is great to have you as a Guest Designer this week ;). WOW....that's all I can say! That rubon is fabulous, as is the paper! Just gorgeous! The buttoned-up ribbon is a perfect embellishment! This is stunning Allisa! Love that gorgeous DSP and your big fabulous bow! Another stunning entry to myAmusing Challenges last week! :) I love it! Fabulous card. Great take on the Twelve Days of Christmas Challenge. Thanks for playing along. We will have another fun one tomorrow!